Description: Yukon River. Detailed map of the Alaskan section of the river, from the mouth of the river to Fort Yukon and the border with Canada. With inset of the area of the Bering Sea and North Pacific Ocean from Siberia to Alaska, Canada and North America. 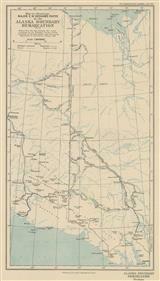 Description: Northern Alaska from a survey by E.W.Nelson showing track of sledge expedition made during 1878-1879. Description: Southern part of Alaska. To illustrate the paper of Lieutenant H.W. Seton Karr. Inset map of Mt. St. Elias. Original colour. 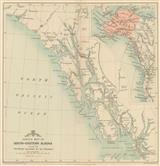 Description: Miniature map of Alaska set within vignettes showing bear hunting by American whalers and seals resting on ice. Printed colour. Description: Alaska. State map. Original printed colour. 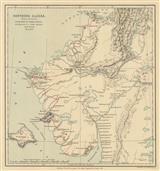 Description: South-Eastern Alaska showing the routes followed by the Steamers. Original printed colour. Description: Alaska Boundary Demarcation shwoing the routes travelled by the boundary survey parties.